What is chia? When the word ‘chia’ is mentioned, it may bring to mind—especially among North Americans—the “chia pets” that are sold as a novelty item. These claybased figurines come in a variety of animal shapes with chia seedlings grown on the tops to resemble animal fur. But chia (Salvia hispanica L) has a long history as a food crop, both for humans and animals, and is being “rediscovered” for its nutritional value and health benefits. Chia originated in southern Mexico and Guatemala. The Aztecs used chia for food, medicine and oil; the crop was so valuable that 21 of 38 Aztec states gave chia in annual tribute. Some historians suggest that chia was as important as (or more important than) maize as a staple food. An article in the journal Economic Botany by Joseph Cahill (volume 57 number 4, “Ethnobotany of Chia, Salvia hispanica L. (Lamiaceae)), shared information about chia based on written accounts and conversations. Before 1600, “a common practice of roasting and grinding of the seeds into a flour known as Chianpinolli mimicked the processing of maize grains and often the two seeds were processed simultaneously. The Chianpinolli became incorporated into tortillas, tamales and various Aztec beverages known as Chianatoles.” Oral accounts confirmed chia’s use in this way. “All consultants began by describing a process that involved roasting seeds of maize and Salvia hispanica…together. Once roasted, grinding of the seeds proceeded to make a flour or pinole that is then mixed with water to make an atole beverage.” The pinole was also used to make tamales. A member of the mint (Lamiacea) family, chia is an annual herb that grows to about 1 m in height (Figure 1). The plants have purple or white, selfpollinating flower spikes resulting in white or dark-colored seeds that are 1 mm wide and 2mm long (Figure 2). Chia is marketed under a number of trademark names (e.g. Anutra, Chia Sage, Mila, and Salba). 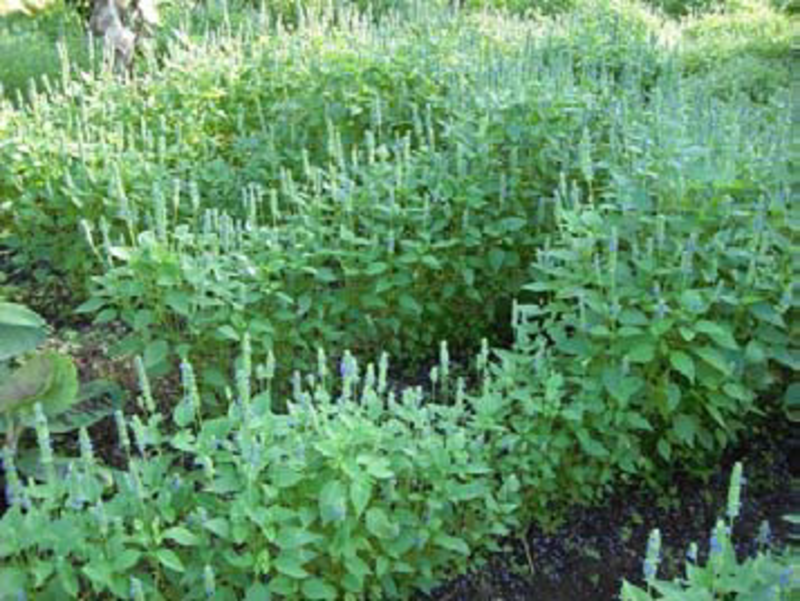 More than one Salvia species is referred to as chia. Salvia hispanica and Salvia columbariae are said to both have nutritional benefits, but S. hispanica is the domesticated type with seeds produced in the flower instead of within sharp-tipped bracts (part of flower structure). What are the benefits? In recent years chia has gained significant attention as a dietary supplement. It is even described as a “super food”. I found an abundance of information on the internet, much of it posted by companies selling chia products. There are, however, online links to technical data and scientific journal publications, some of which are referred to in this article. According to the Nutritional Science Research Institute (NSRI), a non-profit organization that provides information on nutritional supplements, chia seed is considered a Dietetic Nutritional Supplement by the Food and Drug Administration in the United States, and qualifies as “healthy food” by NSRI’s standards (www.nsrinews.com/nsriChia_research.html). Very nutritious: The nutrient-dense seeds contain roughly 20-30% protein, 30-35% oil and as much as 25% fiber. Chia is promoted as a rich source of omega-3 essential fatty acids, antioxidants, dietary fiber, protein, and vitamins/minerals. Long storage life: Like moringa powder, chia seeds can be stored before consumption. As long as they are kept in a cool (but not freezing), dry location or container, chia seeds can be stored for as long as 3 years without deterioration. Healthy oils with no cholesterol or anti-nutritional factors: Chia is one of the richest sources of omega-3 fatty acids [surpassing flax (Linum usitatissimum)]. 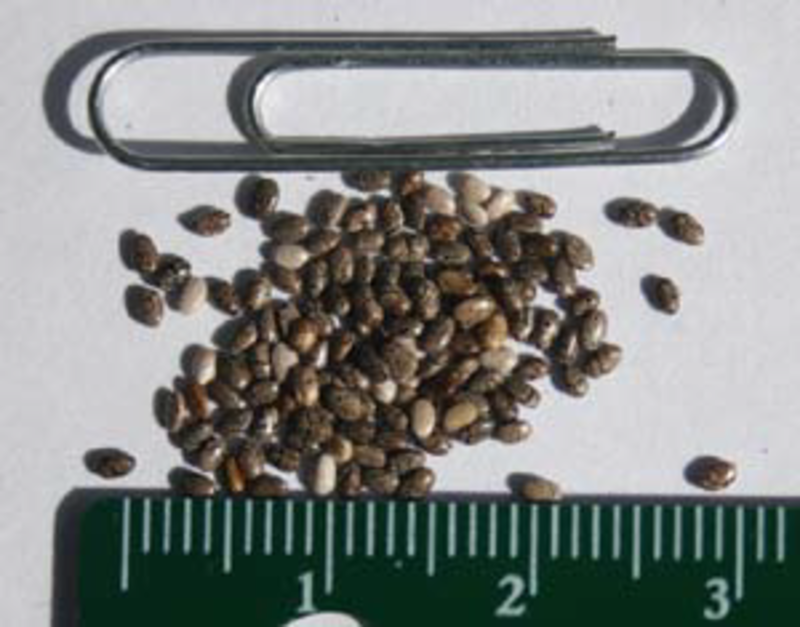 Easy to save seeds: Chia is a self-pollinated crop, so it is easy for farmers to save seeds and multiply the crop. There may be some benefit to purchasing initial seed stocks from suppliers who can provide certified seed. Resists insect pests: One source noted that, because of their high oil content, the leaves of chia plants repel insects. Weed suppressor and pollinator enhancement: This is an interesting one. A USDA-Agricultural Resource Service posting (www.ars.usda.gov/pandp/docs.htm?docid=19317) mentioned that, in the United States (in Beltsville, Maryland), a chia planting in late July/early August attracted bees and performed very well as a weed-suppressing cover crop before the plants were killed by frost in December. In Central America, some consider chia weedy because if it is allowed to remain in the field long enough, the crop will reseed itself. How is it eaten? Chia seeds can be eaten raw or ground into flour and incorporated into bread or cakes. Water can be added to the seeds, which results in a gel that can be consumed as a drink (often combined with other juices to add flavor). A suggested approach is to soak 1/3 cup of seeds in 2 cups of water (or, for smaller quantities, 1 Tbsp of seeds in 1/2 cup of water) and let it sit for 9 minutes, which is enough time for the gel to form; amazingly, the seeds can soak up 10 to 12 times their weight in moisture, whether water or juice is used (www.herbco.com/p-928-chia-seed-whole.aspx). Soaked seeds are gelatinous in texture, and are used in porridges and gruels. Basically, chia seed can be eaten in a variety of ways. The seeds have a mild flavor and can easily be mixed with traditional foods without affecting the taste. Some sources suggest a daily consumption of 4 teaspoons (15 g) per person per day, although most state that there is insufficient data on which to base firm recommendations. How is it cultivated? Chia prefers well-drained soils of light to medium texture. It is not particular with respect to soil pH, but it does require a sunny location. A spacing of 4 in (10 cm) between plants was suggested in a USDA-ARS document. For cover-cropping, though, where complete ground coverage is the goal, they suggested a spacing of 2 in (5 cm), which amounts to a seed sowing rate of about 5 lb/acre (5.6 kg/ha). Flowering and seeding occurs 90 to 120 days after planting. Chia is a short-day plant, meaning that it will flower and produce seed in the tropics/subtropics; however, in northern temperate areas it may not flower until fall when the days shorten and the crop can be damaged by freezing temperatures. Harvest the seeds when they are mature and then allow the seed structures to dry, after which they can be threshed (one way would be to beat against the sides of a container or winnowing basket) and then winnowed to remove the chaff. In Argentina, seed yields of up to 1602 kg/ha have been obtained (see www.hort.purdue.edu/newcrop/proceedings1996/v3-045.html; this site also contains a table showing some data on economic returns). Can I get seeds from ECHO? Yes. Clayton Phillips, working with Seeds for Life (http://seedsforlife.net/) to promote chia in the Philippines, shared a bag of seed with ECHO recently. Network members may request a complementary trial packet. We would like to hear of your observations.